With $1 million on the line, cheering crowds and drivers from the likes of McLaren and Ferrari, the inaugural Visa Vegas e-race did a good job of conveying at least some of the spectacle of a physical motor rally. Held on the final day of CES 2017, the competition saw 30 competitors take to the tracks in a race that was streamed on Twitch, with a live audience numbering in the hundreds. The spectators, a mix of fans and corporate sponsors, cheered, winced and applauded the challengers, which included 20 professional Formula E racers and the world's 10 best simulator drivers. The million-dollar prize pot consisted of $200,000 for the big winner as well as prizes for pole position and best lap. In fact, in the Vegas e-race, simply taking part counted for something: Even the 30th place took home $20,000. In comparison, the total prize money for the iRacing World Championship (sim racing's biggest race until now) was $30,000. That's not to say there's no room for growth, though: Last year's Dota 2 competitions had a prize pot of $18.6 million. The whole event was organized by Formula E, which explains why all 20 of its drivers (and all 10 teams) participated in the race. Each simulator racer was paired with one of the teams. 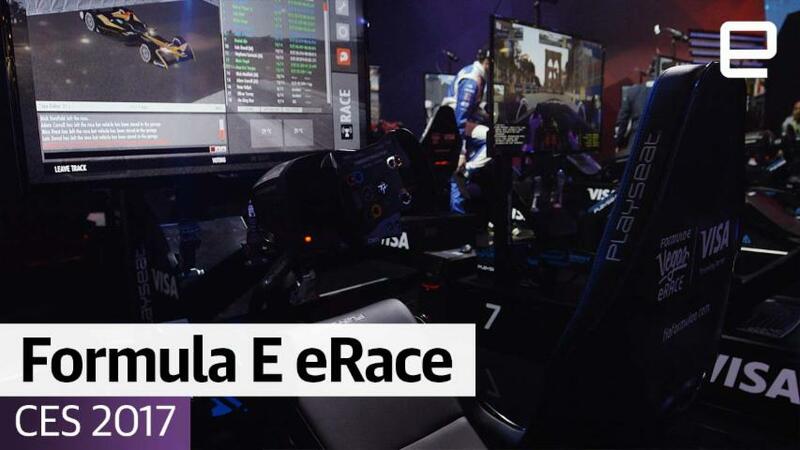 Who would have the advantage -- the Formula E racers or the sim-hardened drivers? That would depend on how good the simulator is. Panasonic Jaguar's Formula E racer Mitch Evans told Engadget ahead of the Vegas showdown that simulators have been used by pro drivers for decades. "Some simulators give you feedback from the road, while most of them will offer force feedback to the driving wheel," he said. "But it's always artificial; it's not the same as driving in real life. You're forced to use your eyes a lot more to get the information you need during the race." Sim racers went on to dominate the starting grid following the preliminary races, with only one Formula E racer, Felix Rosenqvist, placing in the top 10 at the start. 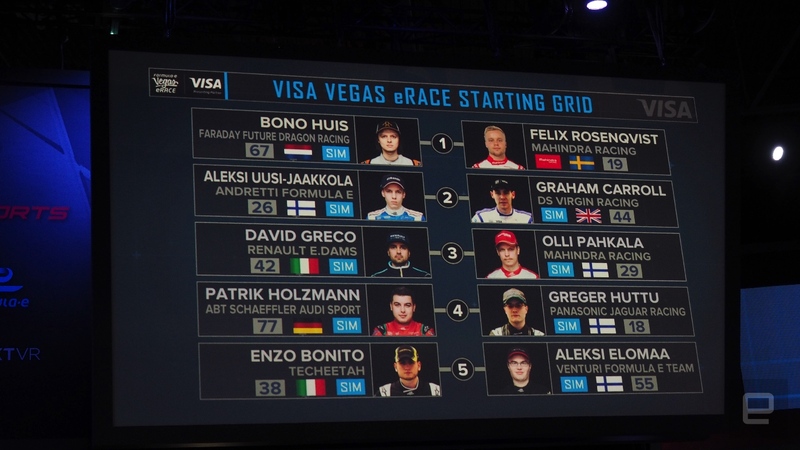 The Vegas e-race even had its own scandal: Sim racer Oslo Pahkala was crowned the "on the road" winner, but race stewards penalized him after the race for his illegal use of Fanboost, a social network-powered bonus for racers that organizers added to the debut eRace. (Organizers say it was a software bug.) 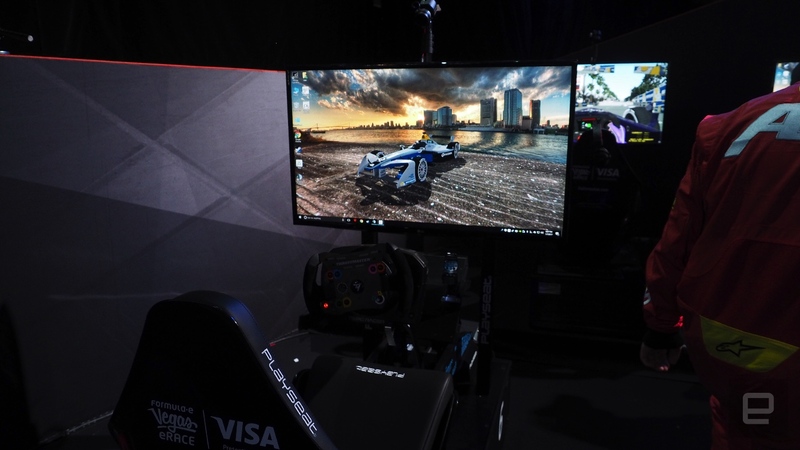 Fellow Sim racer Bono Huis, who dominated the the competition, was the eventual winner of the Vegas eRace, laying claim to $200,000 in the process. Formula E's Rosenqvist maintained his place on the starting line, finishing second and earning the honor of highest-placed pro driver. The Vegas e-race is off to a strong start, but it has a long journey ahead if it's looking to match the popularity (and prize pool) of the world's biggest e-sports.